As I’ve written before, the Zero Moment of Truth (ZMOT) has fueled dramatic changes in how the buyers and sellers interact. While most of the attention has gone to how buyers have radically changed how they behave during the early parts of their buying journey, a very important ramification is often overlooked. As a result of buyers’ access to self-served information, when the buyer and seller first meet, they start out of alignment and out of sync. In traditional buying processes, the first meeting between a buyer and seller represented the beginning for both parties. As a result, significant money and time was invested in creating consultative or solutions-oriented sales approaches. This strategy worked well because there was a synchronicity between the parties. Synchronicity is a very important, rarely discussed component of a successful account strategy. When buyer and seller are in sync, trust quickly builds and normal bumps and obstacles that appear in the sales process are easily bypassed. When they’re out of sync, the buyer’s reptilian brain subconsciously starts firing, and even the smallest blips become major barriers that halt progress. Recent research highlights just how acute this problem is becoming. 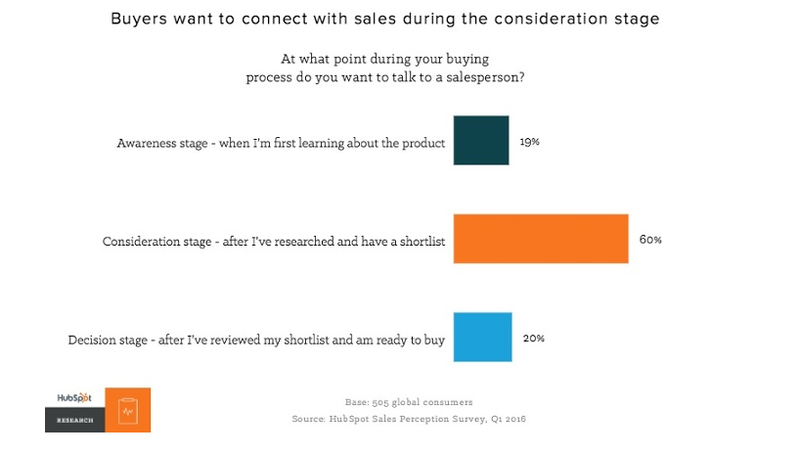 In January and February, HubSpot Research conducted a comprehensive survey to identify what’s on the minds of both buyers and sellers at the beginning of the sales process. The results remind me of the famous relationship book Men Are From Mars, Women Are From Venus, except that the void between buyers and sellers is bigger. As you see, most buyers want to talk about price first, yet very view sellers are willing to do so. (More on this below.). Additionally, buyers want to know how the product works and salespeople are not prepared to talk about that. Salespeople, on the other hand, want to talk about what the prospect is trying to achieve, the reason they’re looking to make a purchase and the overall goals associated with the purchase. And, of course, they also want to know who is responsible for making the decision. Buyers, as the chart show, are not particularly interested in discussing those items. Making matters worse, salespeople are often confused with what buyers want (kind of like Mars and Venus, don’t you think?). 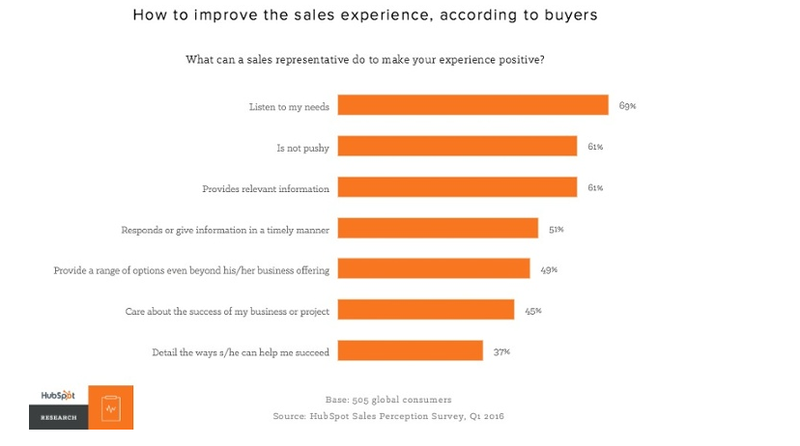 The chart below is how buyers responded to the question about what salespeople can do to make the sales experience better. Topping off the list is “listen to my needs.” I know from my coaching conversations with salespeople that the reason they want to talk about goals, rationale and process is precisely because they want to understand and “listen” to the prospect’s needs. The results of this survey demonstrate that all too often the very actions that salespeople are taking to build trust and alignment (and that worked in the past) are contributing to the frustrations that buyers have about salespeople and the sales process. A major cause of “selling getting harder” is that traditional approaches are simply no longer effective. Selling organizations must change their approach to align to the new realities of today. Here are five adjustments that must be made to begin getting the seller/buyer relationship back in sync. In the old days, the manner in which salespeople initially engaged with prospects and asked questions to understand their business issue, goals objectives and buying process was a crucial first two to a strong start. Today buyers don’t have the time or inclination for that approach. You must know who your customers are and the issues they’re dealing with, before the first sales conversation. How do you do that? A primary reason that prospects want to talk about price at the beginning of the conversation is because they’ve often conducted their preliminary research and think they know what they’re looking for. Without a proactive demand generation process (see below) your prospects aren’t looking to be educated. What that means is that your sales process must begin before salespeople connect with prospects (and this includes making additional sales to existing customers). The best time to influence, enlighten and, yes, challenge your prospects’ thinking is before they’re engaged in an active sale. This is what inbound marketing is really all about. Sure, the lead generation impact from inbound is huge and gets all the press, but the impact it can have on influencing prospects before your sales team can connect with them can be even more powerful. It’s time to transform how you think about and utilize marketing to pick up and drive crucial sales results. To paraphrase an old U2 live shout out, there’s been a lot of talk about the stats surrounding buyers’ predisposition to manage the early stage of the sales process on their own - maybe, maybe too much talk. 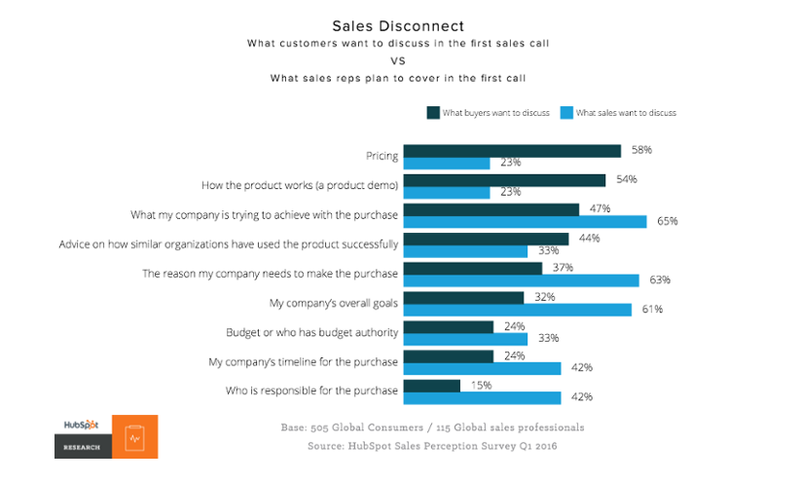 While the stats are often overplayed, they came up again in the survey, as buyers indicated they want to connect with salespeople at the consideration phase. The important takeaway here is that this is when buyers reach out to salespeople. Nothing says that salespeople can’t reach out to buyers earlier in the process. 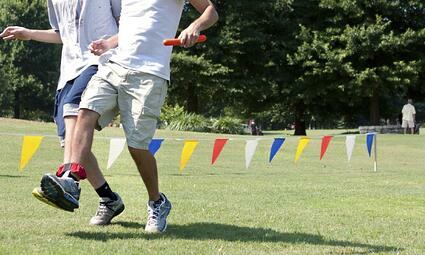 Effective outbound and sales development strategies are designed to do just that. If you wait for buyers to reach out to you, it’s a pretty good bet that they’re reaching out to others as well. However, if you design your outreach effectively, you can initiate conversation when no one else is there and be the one who initiates the journey, thus giving you a significant selling advantage. Being pushy is absolutely the wrong tactic to take. However, I’ve noticed that far too often salespeople are overreacting and becoming passive, letting the prospect control the entire process. This is a bad strategy for the seller, and a bad process for the buyer. As a selling organization, you need to have a defined process built upon data that identifies the key points that lead to a successful sales outcome. Your salespeople must become greater value creators, and to do that consistently, you must build the process that makes that happen. The price conversation today is totally different than it was when I started selling. Another implication of the shift of power from seller to buyer, is the psychological need for equity on the buyer’s part. A driver of the desire to know price early is that for years it’s what salespeople held back and it gave them the power. Today, when prospect’s don’t feel they know the price, they don’t feel as though they’re in an equitable situation and that can trigger many negative reactions. I understand the desire to hold back on price. You want to establish the value and demonstrate your impact so that there’s context to understand price. While there are still some situations where that approach works, they’re getting increasingly sparse. I know that I’m far more sensitive about this issue when I’m on the buying side. I’m rarely comfortable engaging in a serious sales conversation with anyone if I don’t know the price (or at least a reasonable range) before engaging. On more than one occasion, I’ve simply refused to move forward with a seller because they wouldn’t share pricing information up front. Later, after selecting someone else to work with, I found out what the pricing would have been. In most cases, I had either selected a vendor who was charging more, and when I wasn’t the price would not have been a barrier to me moving forward. In today’s world you simply must be prepared to discuss price when your prospect wants to, the failure to do so is simply too risky. As the world of sales and marketing continues to evolve, it is crucial that your approach keep up.